I bet you’ve heard the saying “Creativity is just intelligence having fun.” Whether it was Albert Einstein who said it or not, that phrase just sticks in your mind. It may, in fact, stick so well that you can’t get rid of it while you’re trying to handle your daily missions for project management in a creative agency. Encouraging and streamlining creative processes is tricky; leaving them to run on their own is even more dangerous. Managing a group of people expected to come up with the next most brilliant idea in the whole wide world can be quite a ride. It’s definitely not the same as organizing the work of a software development team, or, for that matter, of an accountancy firm. Creative project management requires you to get creative. But, the good new is, you’re not the only one facing this conundrum. Many have tried the same path before you and can share their knowledge. Here are just a few of the ways you can ace project management in your creative agency and the tools that can help you achieve that. If somebody tells you creative project management is not rocket science, don’t believe them. They live in a fantasy world. Managing a team of creatives can be just as complicated as designing transportation to outer space. But you can do things – really basic things – that can make the experience rewarding and meaningful for all parties involved. Here’s how. Coming up with innovative and attractive ideas rarely happens on a production line. Creativity requires time, space, and, most importantly, mind space in a person’s head. Respect the needs of your team members and give them the flexibility they require. It’ll pay off. No creative team is the same. Your Psychology 101 class can come in handy here. In fact, it’s best if you walk the extra mile and take a course in organizational psychology. It can help you get a hold of the dynamics in the group, as well as catch the nuances of different team members. Grab your 14 day free trial today! Few people enjoy being between the hammer and the anvil. As a project manager, it’s often your task to manage client expectations and liaise with the creative team. Besides your work with external parties, your big job is to deliver succinct and important feedback to creatives. While outstanding problems with your team’s work needs to be addressed, not every client’s whim has to reach their ears. The most demotivating thing for a creative person is to realize the people you create for don’t appreciate your efforts. One of the most important things you have to deliver to your creative team is clarity. They need to know what they have to do, how they are expected to do it, and when they need to get it done. To make their lives easier, a project management schema has to provide them with step-by-step processes for achieving their tasks. It’s simple: when you create a working framework, they can focus on creative work rather than bureaucratic issues. Successful project management in any team, of any size, requires flexibility and the expectation of change. Even if you have perfect processes, different projects and groups of team members may need novel approaches. Keep your mind open and don’t turn into a processes’ policeman. Instead, use your power to steer the team toward the most appropriate path for the current circumstances. As the leader of a creative team, you need a deep understanding of what the creatives in your brainstorming room have to achieve together. It’s not only about distributing tasks and ensuring their completion – it’s about the whole path your team members have to walk to deliver great results. You need a ton of empathy to be a good project manager in any field, but in the creative industry, understanding emotions is crucial. The creative process can be excruciating for the creator. It can reveal the creator’s insecurities, since they only want their work to be appreciated. That’s why you need your best mix of compassion and inspiration to handle problematic situations. Having the right tools for managing your creative team’s work should not be underestimated. You need more than a project scheduling software, though. It’s better to use tools that are designed with the creative process in mind, or that can be adapted to its specifics. Here are a few of the best. 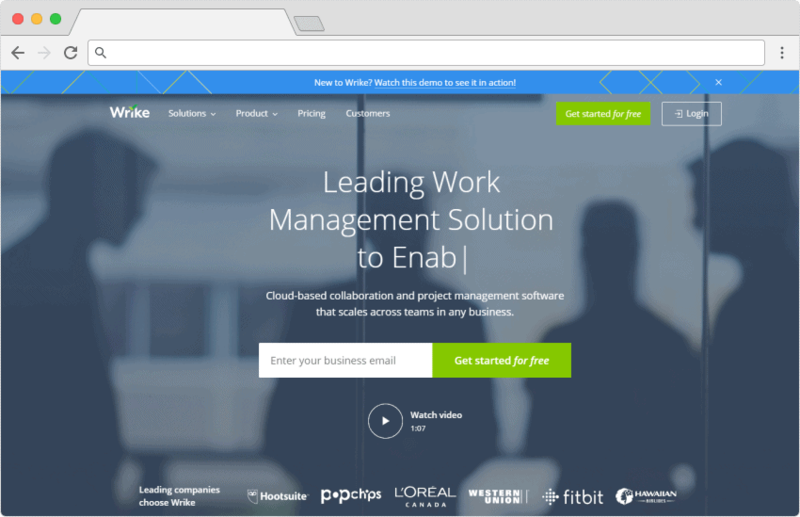 Wrike might be the top choice for a creative project management tool on the market. The platform has a special solution tailored to the needs of creative teams. Wrike has an extension for Adobe Creative Cloud, which is a great benefit for creative agencies. Your team doesn’t need to constantly switch between tools to understand what needs to be done. You can all read and write comments to files from Adobe software, as well as upload new files or versions. The project management platform allows for easy distribution and oversight of tasks and team members’ workloads. It also provides for a clear approval process. You can use project templates or set custom workflows that best match the needs of your team. Wrike also gives you seamless budgeting and reporting right in the same tool. Trello is a Kanban-style project management platform that serves teams from all business venues. And managing the work of a creative team is certainly one of Trello’s strengths! Trello is so good for handling the tasks of a creative agency because of its inherent flexibility. Its board structure also offers great, clear visibility. You can create boards for different projects where each task is represented with a card. You and your team members can move cards around as needed, which allows you to easily adapt to changes. All the information creatives require is right there in a task’s card. You can add files, checklists, comments – whatever is needed. 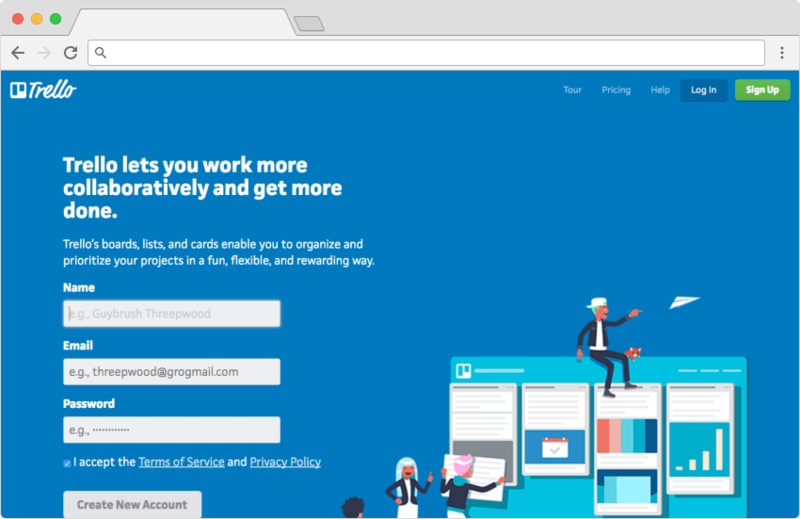 Plus, Trello integrates with a ton of other work tools, which makes it easy to plug it into your workflow. 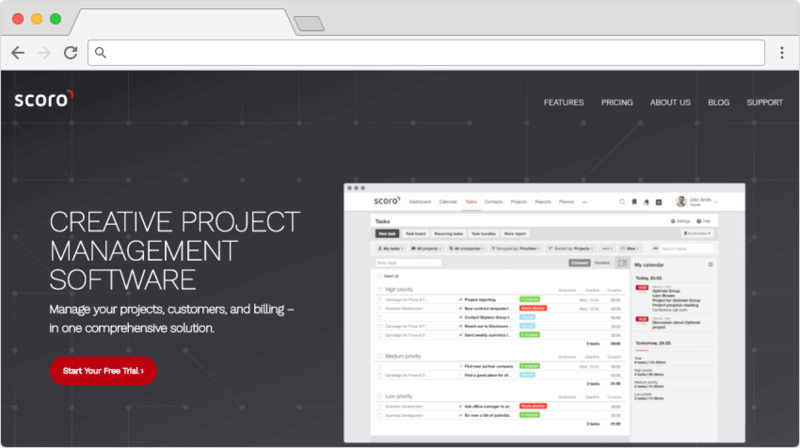 Scoro is another great pick for creative project management. The tool has a specialized offer for creative teams that enables collaboration in the context of the creative process. Its promise is that it will help you bring structure to your work. The platform allows you to schedule and track tasks, as well as oversee the distribution of work among team members. You can manage all of your accounts in one place, plus share all relevant files in the tool. You can also charge your accounts with one click. Finally, Scoro provides you with a shared team calendar and thorough work reports, so you can get full visibility on your team’s progress. 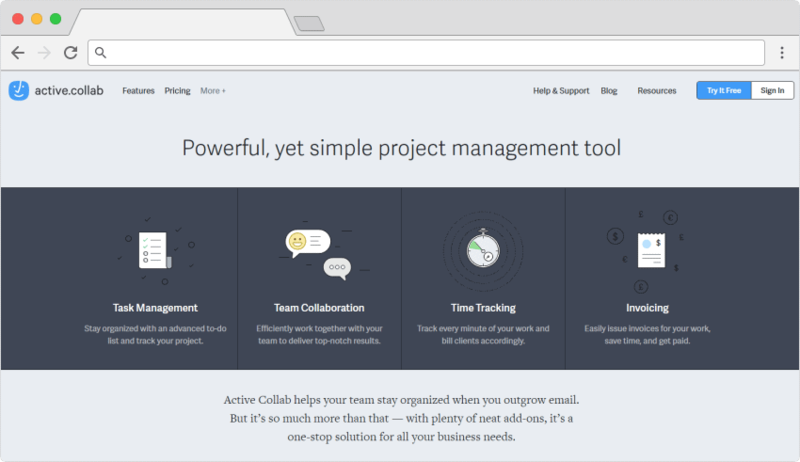 Last but not least, Active Collab is a good option for managing your creative team’s work. After all, it’s no coincidence that it’s the tool of choice for creative companies such as Ogilvy and Publicis. Active Collab enables you to keep everything relevant within the platform. It allows you to filter tasks by different categories, such as labels and due dates. 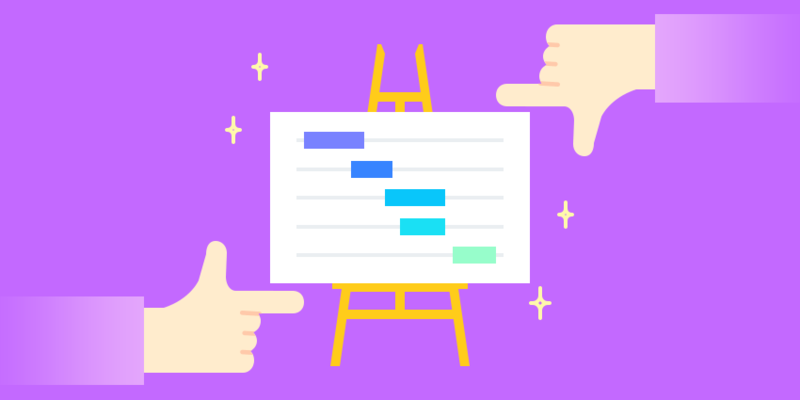 You can organize your workflow as best fits your team’s needs: as a Gantt-like timeline, as a Kanban board, or as a simple list. You also get a shared calendar where all tasks are visible immediately. The tool offers you a note-taking capability as well, so team members can collaborate on texts with ease. With Active Collab, you can take care of budgeting and time tracking too. You can send invoices and receive online payments straight in the platform. Learning the intricacies of managing creative teams takes time. How do you know you’re there? If your team members come to you with stunning new ideas, you’re probably doing something right. But since most of us are still getting there, make sure to check out the basic tips we’ve just reviewed – and don’t be shy to use software that makes your job easier. How do you improve your creative project management? We’d love to read your insights in the comments!